Refer to “rear brake caliper removal and installation” . 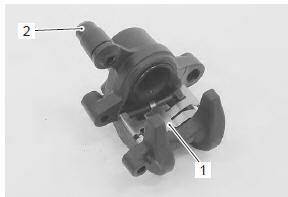 Remove the pad spring (1) and rubber boot (2) from the caliper. Place a rag over the piston to prevent it from popping out and then force out the piston using compressed air. 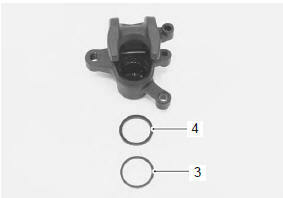 Remove the dust seal (3) and piston seal (4). 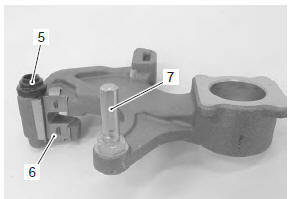 Remove the rubber boot (5), pad spring (6) and sliding pin b (7) from the bracket. wash the caliper bore and piston with specified brake fluid. Particularly wash the dust seal groove and piston seal groove. Replace the piston seal and dust seal with new ones. Apply the brake fluid to dust seal (1). Apply grease to the piston seal (2). 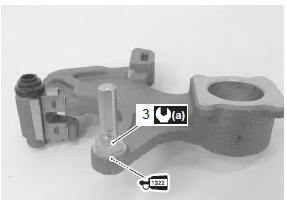 Install the piston seal (2) as shown in the figure. Apply thread lock to the thread part and install the sliding pin b (3) to the bracket. Install the rear brake caliper. Refer to “rear brake caliper removal and installation” .